A completed restoration of this old Coast Guard station in Killybegs was undertaken by Tirconaill Damp Proofing. We received the following recommendation by the owners Mary and Timothy Upchurch. Built in 1875 the property is of historical and architectural interest, consequently the Heritage Council of Ireland agreed to provide funding for the major external works in particular re-roofing, requesting the use of only traditional materials to retain the original features. The Tower House and the adjoining cottage had extensive restoration works carried out George Flaherty and Paul O'Gara, Tirconaill Property Maintenance. 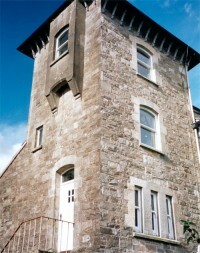 Both properties in particular the Tower House, required extensive external and internal work. When the external envelope was sealed and the building fully ventilated work progressed to internal restoration, which was considerable, due to previous water ingress from the roof. There was extensive dry and wet rot, which required an intensive treatment programme involving the removal of infected material and treatment of walls, foundations and remaining wooden structures. George and Paul applied up-to-date techniques and materials resulting in the clearing of all infestation. They are now in the process of completing the major internal reconstruction including the replacement of floors, ceilings and staircases. In addition they are in charge of the installation of new, water, oil and electrical services. The work throughout is of a very high standard and all carried out within schedule. The modern amenities have been integrated into the original fabric of the building thereby retaining the character of the property. My husband Tim and I wholeheartedly recommend George Flaherty and Paul O'Gara for their expertise and enthusiasm in the restoration of period properties such as ours. They have turned our plans into reality when many other tradesmen showed no interest. Their constant encouragement and commitment during the works when they regularly contacted us by email and telephone has been invaluable and their personal integrity is beyond reproach. Our architect, who is based in Bangor, has only needed to visit occasionally due to the experience and professionalism of our 'team'. Other tradesmen such as electrical and heating contractors introduced by George and Paul have also proved to be equally professional in their work.